« I’m not sure what NBC New York is trying to do. Full moon rising, fire burning. 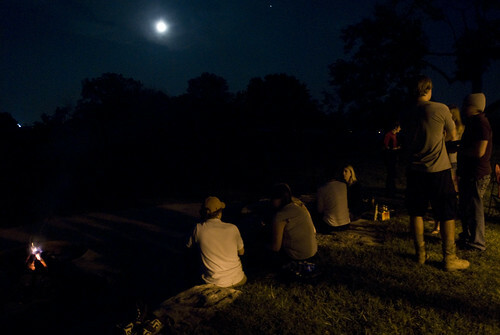 The photojournalism department sponsored a picnic for staff and students tonight out at a local park, Stephens Lake Park. The weather couldn’t have been better – we were originally forecast with 40% thunderstorms and ended up with a cloudless sky all night long. It was nice to meet some of the other photo-j students, although it’s a little intimidating that there’s so many of them and so few of us new kids. I’m sure by the end of this semester, that feeling will dissipate. The semester so far is going well. My brain hurts, but that’s to be expected. There’s a ton of information being crammed in there. Thankfully, as I explained to my adviser today, it’s all things I’m interested in, so it’s slowly finding places to sort out and settle into. Lots and lots of readings, and a ton of writing to match. But every day, when I go to bed, I think about where I’ve been and where I am and where I’m heading, and I’m undoubtedly happy with my decision to come here for school. It was the right time, and it’s the right place. I miss DC terribly, but I know it – and many of my friends – will be waiting for me at the end. Now to remember how to write academically and not just newsworthy. Urgh – they’re making you write academically? Bad! Bad!